Heat oven to 350°F. Cook and drain spaghetti as directed on package. Meanwhile, in ungreased 2-quart casserole, stir tuna, milk, Alfredo sauce, mushrooms, peas and pimientos. Gently stir in cooked spaghetti. Cover and bake 40 minutes. Sprinkle cheese on top. Bake uncovered about 10 minutes longer or until top is bubbly and beginning to brown. This casserole also tastes great with 1 1/2 cups chopped cooked chicken or turkey. 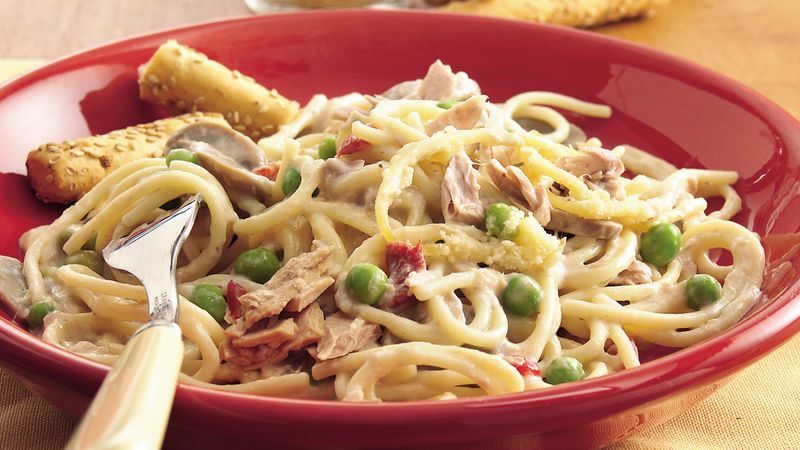 Use 1 1/2 cups refrigerated reduced-fat Alfredo sauce to reduce the calories to 500 and the fat to 13 grams per serving.